After years of planning and designing, you decided it’s time to finally start your own fashion brand. You have dozens of fresh designs, your online store, a website and accounts on all major social media channels. You believe you did everything you could to raise awareness about it but your sales are not going up – in fact still not many people know about your existence. You’re slowly running out of budget and your head lacks creative ideas on how to become ‘the brand’ that everyone talks about. What now? First, you need to understand that fashion is an artistic field thus the industry PR pros and marketers need to think outside the box in their brand journalism efforts. And since fashion is such a “personal” business, knowing your audience and ways to relate to them seems like an integral part of winning at fashion PR. Mark Twain, a great storyteller in his own right, used to say that there is more than one way to skin a cat, and it’s no different for storytelling in fashion. Some brands use their social media channels, others prefer to create an online magazine or engage their customers in other creative ways. We picked the four most interesting cases for you to take a look at and use for inspiration. Those methods will cost you time but almost no money, which is a great thing for a beginner, right? Net-a-Porter is an online store selling luxury apparel. To increase their sales, they decided to go a step further than most companies and created a weekly online magazine. But The Edit is far different from most of the magazines written by their competitors – it’s not solely a space where Net-a-Porter displays its products. 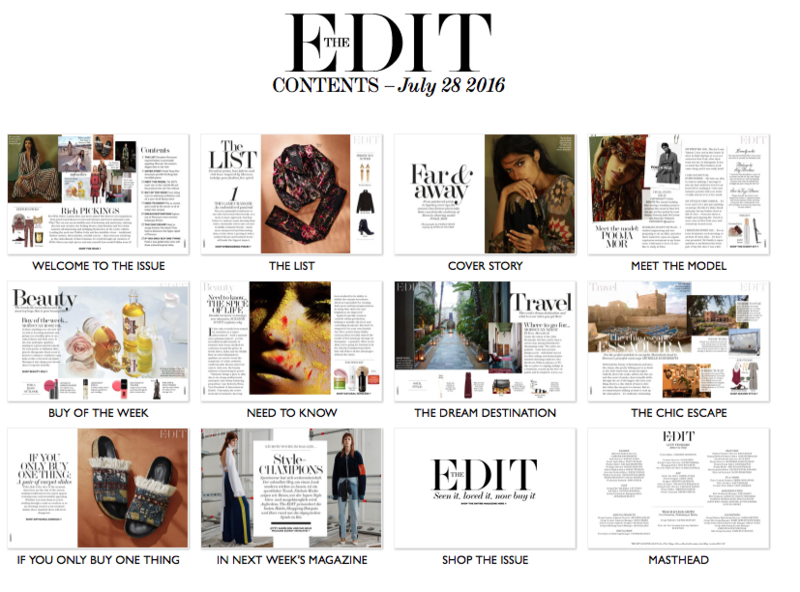 Every issue features separate sections on beauty, lifestyle and travel. It’s full of great content, and thanks to the videos, it’s interactive and allows you to buy the items you saw there by directing you straight to the Net-a-Porter store. Shopping made convenient, easy and very exciting. It gives their customers the feel of wearing glamorous magazine-featured clothes and that’s exactly what they want. That sets The Edit apart from its paper competition and really brings unique value to its readers. You don’t need to create the whole magazine, but think of it more like a catalogue that you share on your social media channels. Take editorial photos, and engage your team and friends to help you with this project. Or simply create a publication on Medium and engage other authors to write there. That way, more people share your content. Just remember – don’t make it too promotional – it’s not supposed to scream ‘look at my awesome brand’ but it’s supposed to intrigue them and make them want to find out more about you. Create your own hashtag. Think wisely, since it’s going to stay with you for a longer time. Try to encourage others to post using it – start with your friends and family and repost their photos on your Instagram. Encourage buyers to do the same – communicate that every person who posts their photo with your hashtag will receive a discount on their next shopping. Since everyone wants to have their 5 minutes of fame on Instagram and people love exclusive deals this a surefire way of attracting people to your brand. Minnetonka makes authentic American moccasins since 1946. A huge part of its success is their history and heritage. In every place possible, they highlight the fact that over the years Minnetonka grew from selling moccasins in a local gift shop into a huge company that despite its success, did not lose its authenticity. Their video story presents the company in a personal way, showing that every single pair of their shoes is handcrafted and made with enormous care. Their ‘from zero to hero’ story which spotlights the link between their success and their loyal customers, gives the audience the feeling of belonging and creates that personal bond companies always search for. Additionally, similarly to Black Milk Clothing, Minnetonka has its own hashtag on Instagram – #myminnetonka. Another solid move, as the hashtag doesn’t only create a buzz around the brand, but by adding ‘my’ to their name, they again highlight the client involvement and encourage users to post using the tag. Write down your own story or make a video. So what that you started just a few months ago? So what that big celebrities are not wearing your clothes, yet? Be authentic and show who you really are. Share it. These days sewing clothes in your basement after hours is nothing to be ashamed of. It’s real and that’s what customers will appreciate. You don’t have to look further than Warby Parker to find a great example of professional storytelling. They managed to mix and match various social media channels to get their story out, and the results speak for themselves. Their secret to success is simple – they understand who their target group is. They are also aware of the desires and fears of millennials and know exactly how to use that knowledge. Because the team at Warby Parker knows that their customers want to feel special, they not only repost the photos of their users, but also comment on their posts – EVERY SINGLE TIME! That kind of attention encourages their clients to post under the tag and enjoy their couple minutes of fame. What’s more, they act on the main fear of millennials – ‘the fear of missing out’ – and post different content on different social media channels. Hurry! There’s something fun (and super limited-edition) over on Snapchat now. (Username: warbyparker.) #seesummerbetter UPDATE: the frames are now sold out! This method of cross promoting gives them a massive following on every channel they own.Another great way in which Warby Parker relates to their audience on a more personal level is through Snapchat, the app often used by their target group. Their Snapchat content, however, focuses on the human side of the brand with all of it produced by Warby Parker’s employees. There you will find their dogs, top 5 things they have on their work desks, favorite things to have for lunch, and Q&As with the CEO’s daughter. Not a traditional approach, but definitely a one that works. Another great way in which Warby Parker relates to their audience on a more personal level is through Snapchat, the app often used by their target group. Their Snapchat content, however, focuses on the human side of the brand with all of it produced by Warby Parker’s employees. There you will find their dogs, top 5 things they have on their work desks, favorite things to have for lunch, and Q&As with the CEO’s daughter. Not a traditional approach, but definitely a one that works. Engagement is key. Customers will post more when they know it will be appreciated. Vary your content across different social media channels to take advantage of ‘the fear of missing out.’ Use Snapchat for showing your workplace and your team, but also to share special discounts and do small giveaways. In a blink of an eye you will get a group of loyal customers who like you for who you are. One thing is clear though; stunning visual content that engages the audience is a place to start. Having breathtaking designs and using creative materials is worth nothing if doesn’t give the viewer a chance to relate, interact and finally, belong. Remember about this because others never forget.